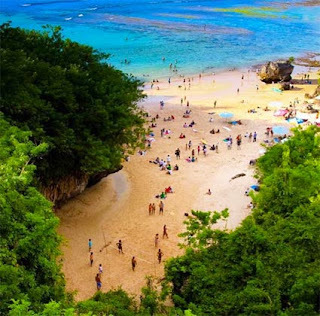 Friend's traveler, there are many alternative beach attractions in Bali that are very beautiful and good for us to visit. One of them is Padang Padang Beach. The characteristics of the Padang Padang beach near the Uluwatu area are very unique, which is slightly different from other beaches in Bali. This beach has a natural landscape background in the form of hilly areas with beautiful green trees. Not only that, the uniqueness of the Padang Padang coastline is more artistic where its location appears to be lined with high and steep rocks. Another unique thing when you visit the Padang Padang beach in Pecatu village is the location of its hidden beaches. To be able to get to the edge of the coastline, we must first pass through the entrance route resembling a cave. Next you also have to go down dozens of narrow stairs and only enough for one person to pass. Such conditions will remind us how we go to Crystal Bay Beach on Nusa Penida right? However, he is guaranteed, how to access the tourist attractions of Padang Padang Beach is easier than down the stairs at Tegal Wangi Beach in Jimbaran. How is a traveler's friend, very unique and interesting right? Well if you are curious, please you can continue the information below. And here are some of the main tourist attractions why you should visit this Padang Padang Bali Beach tour.